Unfortunately bandwidth is highly restricted, so our posts will be infrequent until we return to Wooster. 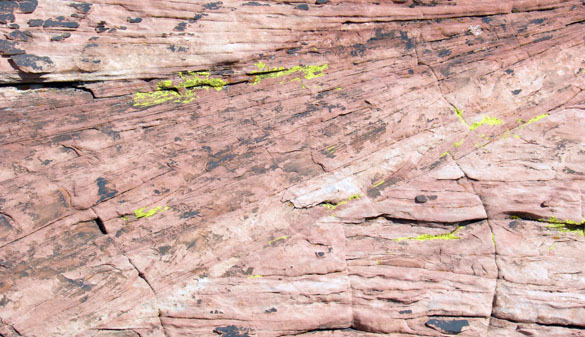 Lichen and bits of desert varnish on the cross-bedded sandstone at the Red Rocks National Conservation Area. 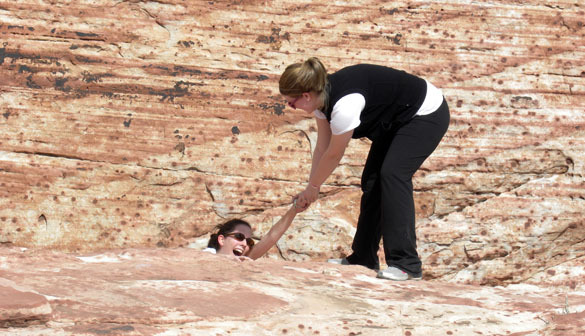 Lindsey Bowman apparently saves Becky Alcorn with a dramatic backdrop of cross-bedding. 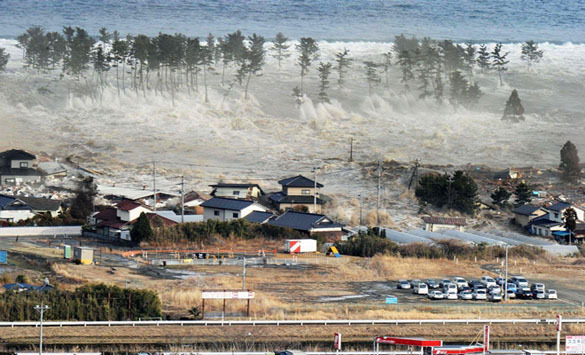 Tsunami bearing down on a Japanese village (March 11, 2011). From the Associated Press. HORONOBE-CHO, HOKKAIDO, JAPAN–I am relieved to report that my friend and fellow Wooster Geology classmate Kaz Aoki and his family survived last week’s devastating earthquake and tsunami. Kaz, his wife Sachiko, their four daughters and their new son-in-law all are unscathed, considering themselves “very lucky”. Their previous hometown, Kamaishi-shi was severely damaged. They say a tsunami warning 30 minutes before the event saved many lives. Kaz is working in crisis mode right now. He is a Principal Senior Scientist in the Japan Atomic Energy Agency (JAEA) at the Geological Isolation Research and Development Directorate. We can only imagine the stress in the face of repeated failures in several nuclear power plants. The Wooster Geology Department, all four faculty members, our Administrative Coordinator Patrice Reeder, and a group of students are leaving this morning for our field trip in the Mojave Desert. This blog will be filled with fun posts and colorful images, as it should be. We will not forget, though, the current travails of the Japanese people and our particular friends the Aoki family. The delicious scallop has a long, long history. Wooster’s variety, known as Aviculopecten subcardiformis, is about 345 million years old. The beauty above was found in the Logan Formation, a conglomeratic sandstone that underlies much of the city, including the college. 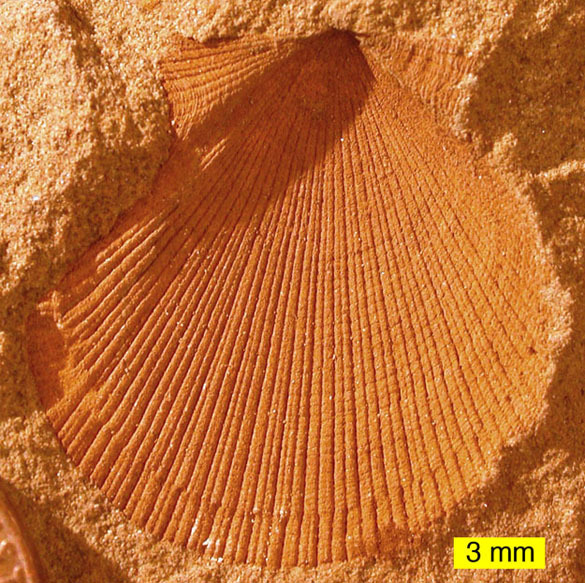 This particular fossil is preserved as an external mold, meaning the shell is dissolved away and only an impression remains in the surrounding sediment. Note that this preservation is still so good that we can count all the ribs and even growth lines. 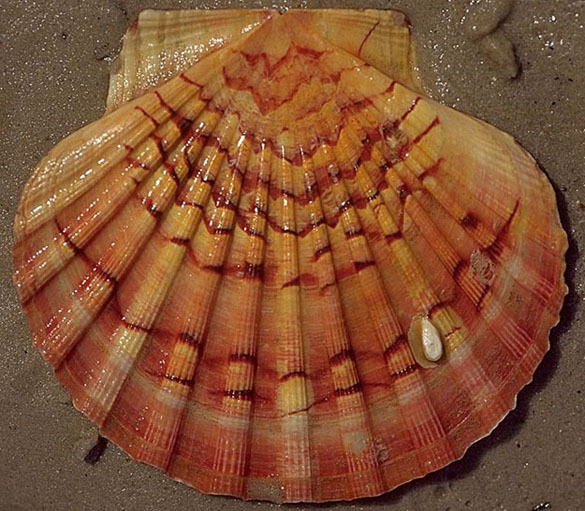 Scallops are characterized by a nearly-symmetrical shell. They have extensions along the hingeline (at the top of the image) that are commonly called “ears” and technically termed auricles. They have one large muscle (adductor) used to close the shell. It is relatively large and the part of the clam we find so tasty. 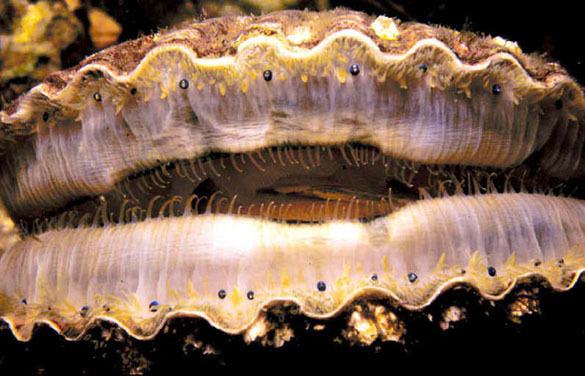 Many modern scallops use that large adductor muscle to clap the valves together when they are threatened, enabling them to swim short distances. As an early warning system to detect predators (including us, I suppose), they have rows of tiny eyes in the soft tissue around the edge of the shell (see below). The eyes of this living scallop are the small bluish spheres along the edge of the mantle. We can’t tell if our ancient scallop was able to see its enemies and swim away. It does, though, take us back to a time when a warm shallow sea covered our little patch of Ohio.